Live rock in your tank should include some basic critters, such as worms, amphipods and maybe micro brittle stars, to help with the detritus. However, you need to supplement them — and that’s where the clean-up crew come in. These are the reef inverts that live in their millions and clean the ocean floors, faces of reefs and all the nooks and crannies in between. Also known as the Emerald crab, Mithraculus sculptus consumes leftover meaty foods and many nuisance algaes. Unlike many other animals, the Mithrax will eat bubble algae (Valonia sp.) and help clean your aquarium. Native to Caribbean reefs, the Mithrax is easily identified by its distinct, flat shiny green body and hairy legs. Being nocturnal it hides in caves and among rubble during the day, but, provided with plenty of rockwork and associated hiding places, will venture out during the day to forage. This opportunistic feeder may turn to corals, invertebrates, coralline algae or small fish should there be an inadequate supply of food in the aquarium. Supplementing its diet with dried seaweed and chopped meaty foods, such as shrimp, and initially limiting numbers to a maximum of one crab per 100 l./22 gal. of tank volume will hopefully ensure that they remain well fed and become a model scavenger. Numerous species of 'dwarf' hermits are suitable members of a clean-up crew. While all are becoming more available, the two most commonly seen are Paguristes cadenati and Clibanarius tricolour. 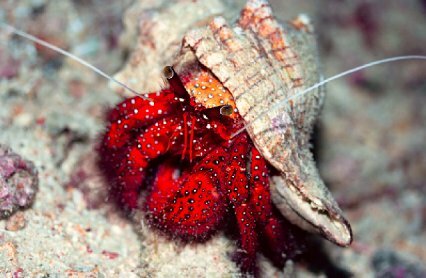 P. cadenati, or the Scarlet reef, or Red legged hermit crab (pictured at the top of the page) has red legs and a yellow face. It’s found along the reef faces and coral rubble of the Caribbean and Western Atlantic where they busily scavenge for organic matter and algae. This crab best kept at a ratio of one per 25 l./ 5.5 gal. in an aquarium where it will have ample supplies of algae and detritus. Red legged hermits are useful for keeping algae, including filamentous algae and cyanobacteria, under control. As well as algae, these eat as much uneaten food in the aquarium as they can find. 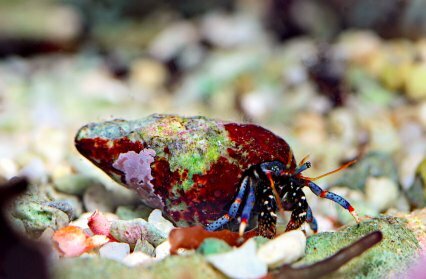 Clibanarius tricolor, or Blue leg hermit crabs, are superb algae-liking scavengers, just like their red legged counterparts. Because of their particularly small size they can get into areas of the aquarium and live rock that are usually difficult to reach. However, C. tricolor is known to occasionally attack snails or other hermits in order to steal their shells. It’s therefore important to provide extra shells in your tank to try and prevent at least most incidents of theft. 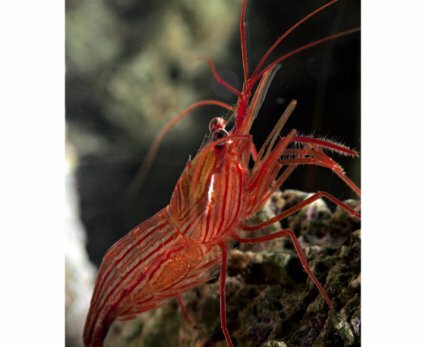 Known to manage nuisance Aiptasia anemones, this brightly coloured shrimp has a transparent body with red longitudinal bands, but can easily be mistaken for similar looking species such as L. rathbunae. Having only subtle differences it is easy to see why some Peppermint shrimps eat Aiptasia, while others don’t. This is only part of the story. If discounting L. rathbunae by choosing those with a darker tail, showing no real discernable striping and a generally darker, more opaque body, we are more likely to have the true Peppermint shrimp. Even so, some individuals may show no interest in Aiptasia. Considered easy going and largely sociable with its own kind, it may fight other species in an aquarium. Some may nip at soft corals, others be model inhabitants. Peppermint shrimps are shy, seldom venturing from rockwork. Given time, adequate conditions and food they should be seen more frequently. Appetite for Aiptasia aside, Peppermint shrimps are valuable scavengers, picking over live rock to consume detritus, uneaten food and decomposing organic material. They can also be prolific breeders, always adding to the aquarium’s food web. While possible to rear the progeny, it’s not simple to raise the larvae through various stages of development. 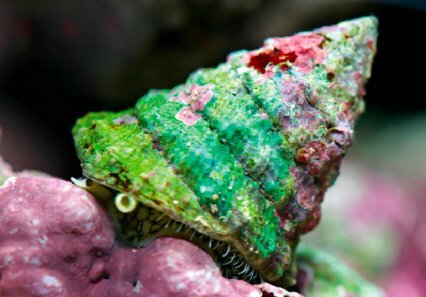 Snails could be seen as essential in any healthy reef aquarium, but choosing the most suitable and judging how many you should have requires consideration. The two generally accepted as forming a major part of any clean-up crew are Astraea and Trochus. You could also include Turbo snails, but their particularly large size and associated ability to tumble corals or indeed rockwork should be taken into account. Turbo fluctuosa is native to the Gulf of California, off the coast of Mexico. It thrives in crevices and holes in natural reefs and in the home aquarium needs ample hiding places among live rock and large spaces to graze. This snail is popular due to its ability to mow vast areas of nuisance algae. Being particularly fond of hair algae, cyanobacteria and diatoms, a single individual can take large quantities and other algae from your live rock and glass. If limited to one per 100 l/22 gal they are efficient grazers and may require supplementary feeding with dried seaweed. Astraea snails (above), which have tan to olive green conical shells with pronounced ridges, are particularly useful for clearing brown and green algae films from aquarium walls. They are capable of controlling filamentous algae, but to a lesser degree than T. fluctuosa. Lithopoma tectum, formerly Astraeca tecta, are more at home on live rock and move between the rockwork and glass. However, as they can’t right themselves if they fall they can be preyed upon by hermit crabs or other scavengers. Because of their voracious appetites, stocking at one per 100 l./22 gal. and monitoring whether additional snails are required would be appropriate. Trochus sp. snails (above) are fantastic algae eaters and are adept at controlling a wide range of algae, cyanobacteria and diatoms in the aquarium. Unlike Astraea, Trochus are able to right themselves should they fall upside down. There are several Trochus species, but the best known is the Banded trochus from Indonesia. Prolific breeders, Trochus snails reproduce by releasing gametes into the water column and are well suited for reef aquariums if kept at one per 50 l./11 gal. This is no definitive list of cleaners, but should at least touch on the more popular species available and each one is capable of doing certain functions better than others. Some come from waters you are not catering for, so choose what’s suitable for your needs. I’ve been conservative with stocking ratios to help you see what one or two of a few species can accomplish. Bigger crabs such as the Anemone hermit (Dardanus pedunculatus), Hairy hermit (Aniculus maximus) and Halloween hermit (Trizopagurus strigatus) are best suited to species-only aquaria. These can be very disruptive creatures, climbing everywhere with their large and bulky shells dislodging corals or loose rockwork. They are also renowned for attacking or eating any other tank inhabitants, if given sufficient oportunity. Commonly imported sea cucumbers belong to the genus Pseudocolochirus, with the most common species being the Indonesian Sea Apple (P. violaceus). This and the more colourful Australian sea apple (P. axiologus) are obligate filter feeders and use tube feet to attach to substrate in areas of high flow. This allows them to expose their feeding tentacles to the greatest amount of flow, so they can collect suspended organic particles. These brightly coloured sea cucumbers are popular because of their beautiful patterning. 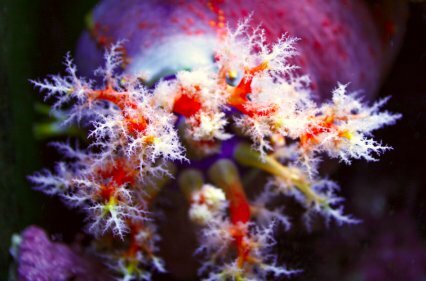 However, sea apples are toxic and display the fact with bright colour patterns. Potent chemical defences are often the last resort of these animals, but the demise of an individual may lead to the release of holothurin and holotoxin, which can be extremely toxic to fish and other inhabitants in an enclosed aquarium. The release of their equally toxic eggs can lead to the demise of all fish in the aquarium. This is also known as the Camel or Candy shrimp and distinguished by a moveable rostrum or beak. It has a variable pattern of red and white body stripes and males tend to have larger claws (chelipeds) than females. It’s a social shrimp which congregates with others of its kind in rock crevasses, under overhangs, or in the coral rubble. It usually tolerates other shrimps, but may nip colonial anemones, disc anemones and soft leather corals, so cannot be considered strictly reef safe. The Arrow crab is nocturnal, rarely seen during daylight. It’s fearless, even of its own species, and as such can be territorial. Two should never be housed in the same aquarium, as they are likely to fight to the death — the winner eating the loser. 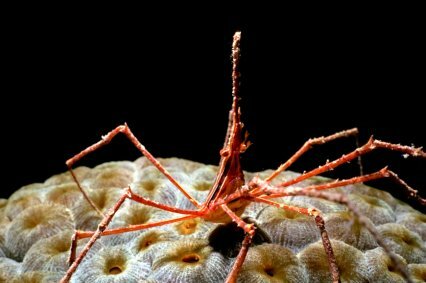 This crab has eight spider-like legs and has a head pointed at the tip, like an arrow. The legs can be more than three times its body length, being perfect tools for hunting favourite foods. Capable of decimating the bristleworm population of an aquarium, they can soon turn their attentions to other more desirable polychaetes and small fish.